RB Jay Ajayi vs. Giants linebackers – With quarterback Carson Wentz ruled out for the season, Philadelphia will rely on their running game, led by Jay Ajayi. Last week, Ajayi led the Eagles’ backfield in snaps and touches for the second consecutive week, generating 80 yards against the Rams. The former Miami Dolphin is starting to heat up with his new club as over the last three weeks, no running back has a higher elusive rating than Ajayi’s 140.0. On the year, the former fifth-round pick has forced 37 missed tackles. Philadelphia’s lead back may be a tough load to handle for New York’s linebackers. Calvin Munson has a lowly 40.0 run-defense grade this season and only six run stops since Week 10. He did, however, earn the second-highest defensive grade on the team during their Week 3 matchup in Philadelphia, of course that was before the addition of Ajayi. Meanwhile, veteran linebacker Kelvin Sheppard has not missed a tackle in run defense since joining the Giants four weeks ago but that could be tested against Ajayi’s elusiveness. C Jason Kelce vs. DI Damon Harrison – Sticking with the running game, no two players are more important to this phase of the game for their respective teams. Kelce leads all centers with a 92.4 overall grade and 98.0 run-blocking grade in 2017. The Eagles’ rush offense ranks second in the NFL at 143 yards per game and the veteran pivot is a key part of this. On the other side of the line, Damon Harrison is once again dominating opposing runners and will be a tough matchup for Kelce. Harrison leads all interior defenders with a 94.7 run-defense grade and is tied for first with 31 stops. His 12.6 run-stop percentage also ranks third at the position after incredibly leading the category for four straight seasons entering 2017. ‘Snacks’ is a force to be reckoned with in the trenches. 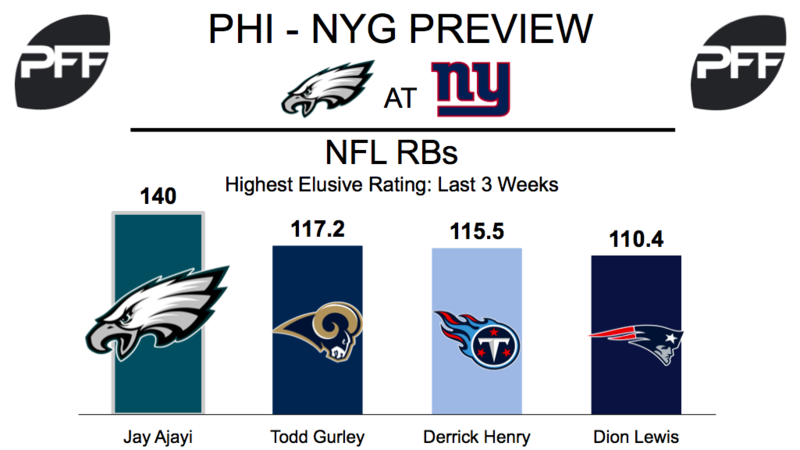 TE Zach Ertz vs. S Landon Collins – With Nick Foles starting for Philadelphia, Ertz could be targeted early and often as the most reliable target in the passing game. The Eagles tight end has missed two games this season with hamstring and concussion issues, but he still ranks fourth at his position with 57 catches and 663 receiving yards. Ertz’s 1.96 yards per route run currently ranks fifth among tight ends and he has the third-highest catch rate when lining up in the slot. The former second-round selection will have his hands full if Landon Collins can go on Sunday. Collins has improved in coverage this year, earning an 84.9 grade. The two matched up on four pass attempts in their Week 3 meeting. Ertz hauled in three receptions for 21 yards, only five of which came after the catch. With Collins doubtful for this contest, an interesting development to watch in this game is if Ertz sees added production, if Collins can’t go. 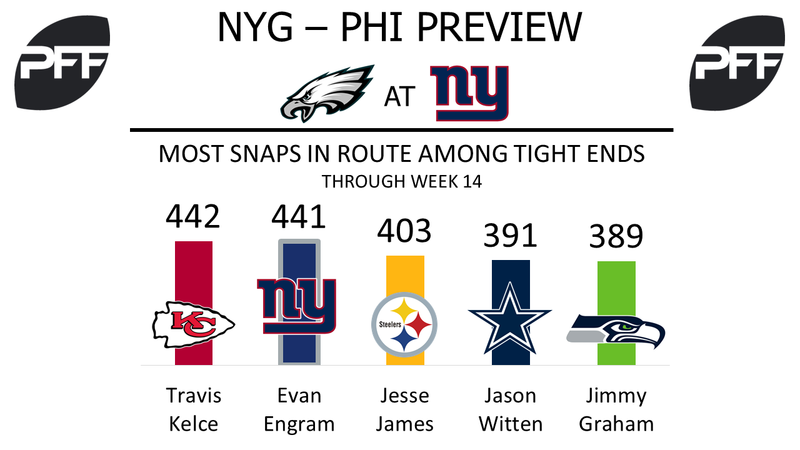 TE Evan Engram vs. LB Mychal Kendricks – The rookie from Ole Miss, Engram, continues to be heavily utilized in the Giants offense. He was targeted seven times last week, bringing his total to 94 on the season, second-most among all tight ends. His 441 snaps in route are just one shy from tying Travis Kelce for the most among tight ends. Engram has a tough matchup this week against Kendricks, PFF’s sixth-highest graded linebacker in the league (87.2 overall grade). Kendricks has been targeted 35 times in coverage this season, allowing 25 receptions for 239 yards and one touchdown. His 239 yards allowed in coverage is the seventh-fewest among linebackers with at least 250 coverage snaps (49 qualifying linebackers). 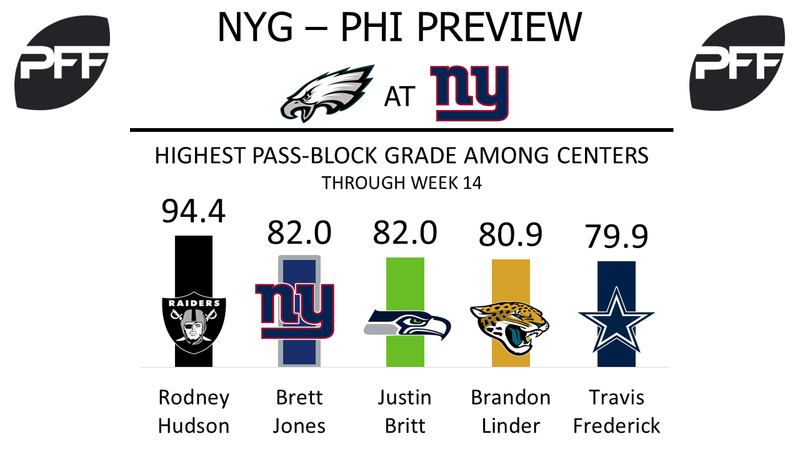 C Brett Jones vs. Dl Fletcher Cox – The entire Giants offensive line should have their hands full Sunday, including center Jones who has performed well in pass protection this season, currently boasting a pass block grade of 82.0, second-highest among 36 qualifying centers. He’s allowed only seven total pressures this year, giving him a pass blocking efficiency of 98.4, seventh-highest among 35 qualifying centers. Cox continues to perform at an elite level, currently grading as the seventh-highest interior defender with an overall grade of 90.1. His pass-rush grade of 90.7 is the second-highest among 109 qualifying interior defenders. Cox’s pass-rush productivity (measures pressure created on a per snap basis with weighting toward sacks) of 11.3 is tied for the third-highest among interior defenders. WR Sterling Shepard vs. CB Patrick Robinson – Shepard was only targeted three times a week ago, and it may not get any better this week. When lined up in the slot, Shepard should face off against Robinson, who’s currently in the midst of a career year. He fields an overall grade of 92.0, third-highest among 118 qualifying cornerbacks and is allowing a quarterback rating of 56.5 when targeted in the slot, the third-lowest among 53 qualifying cornerbacks. Robinson’s 14.5 coverage snaps per reception in the slot is the fifth-best rate among 53 qualifying cornerbacks.